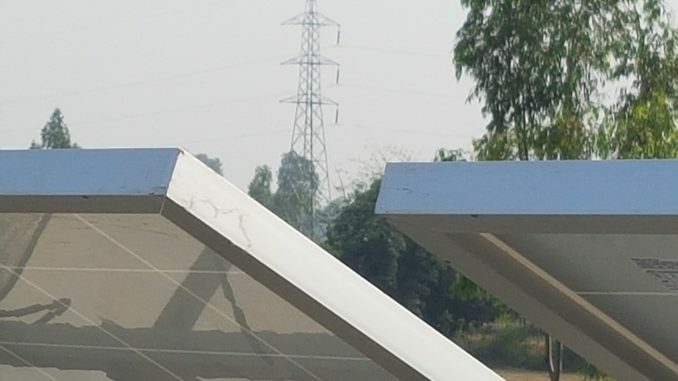 Even with annual growth rates above 10 per cent the share of new renewables like wind and solar in India is unlikely to reach 10 per cent of the mix before 2040. Well, this July (admittedly at their seasonal peak), wind and solar alone beat his forecast by 23 years – contributing 10.4% of total grid power. 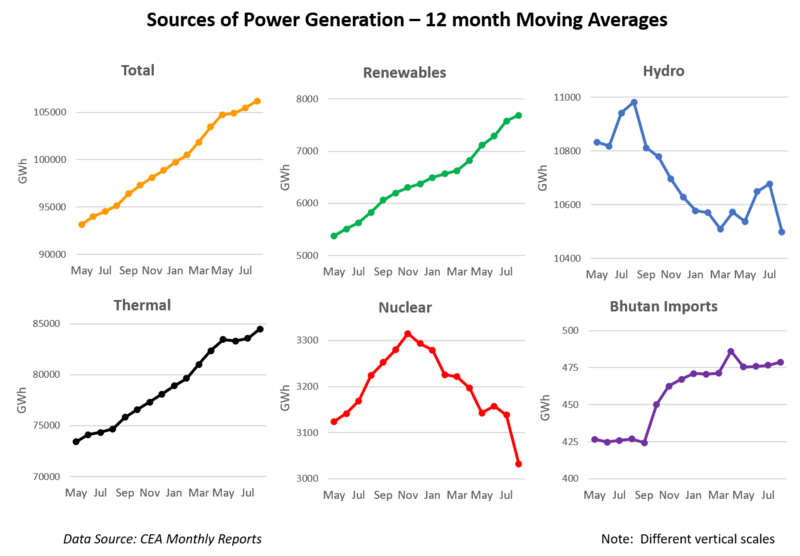 The latest data for renewable power generation is shown below by month from April 2014 to August 2017. This includes the dominant sources of wind and solar, with smaller inputs from small-scale hydro, bagasse, biomass and others. Large-scale hydro is counted separately. Renewable generation is now contributing three times as much as nuclear, and is approaching the levels of (large-scale) hydro. The highly seasonal nature of solar, wind and hydro in particular makes it difficult to extract trends from month-by-month generation. A fairer way to gauge changes and compare sources is to compute 12-month moving averages backwards from the current month, as this averages out seasonal effects. These are plotted below, (but using different scales to emphasise trends). There are large increases for total, thermal and renewable generation. Although coal is still adding much more than renewables, on a year-on-year basis renewables added more to the grid than thermal for the first time this June and July, coinciding with coal’s plateau and renewables’ peak. This was true for the actual monthly additions, not just the 12-month moving average. There is continued slippage of (large-scale) hydro, ups and downs in nuclear, and rising but negligible imports from Bhutan. NOTE: Please see December post which updates and corrects some errors for non-renewable data in the following figure. To put these sources in perspective, it’s worth remembering that for the time being, thermal power remains the dominant source and that there’s some way to go before renewables contribute most or all of the monthly increase in generation. When this happens, though, it could spell the end of ever-increasing coal-fired generation in India, even while it remains a smaller absolute source. One source suggests solar will generate more power than thermal as soon as 2027. 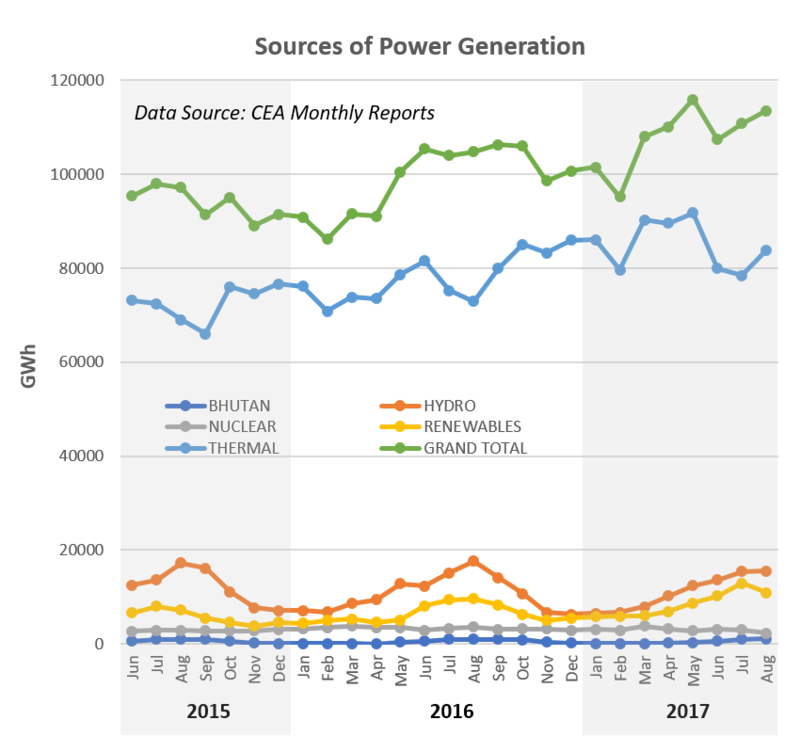 In addition, there’s some evidence that the current increase in thermal generation is outpacing the increase in coal consumption for power, the subject of a future post. ” wind and solar alone beat his forecast by 12 years”. Isn’t it 23 years? Thanks for spotting the error, JQ, Mr. Sporton’s extreme pessimism about renewables temporarily distorted my arithmetic – figures now corrected.